It’s perhaps the most famous highway in the world โ€• California State Highway 1, a narrow strip of roadway between the cliffs and the ocean on the very edge of the continent. Blessed with spectacular natural landscapes, inspiring ocean views and the echoes of California history, Highway 1 is a scenic drive like no other. The sequel to the authors’ acclaimed book “An Artist and a Writer Travel Highway 1 North,” “An Artist and a Writer Travel Highway 1 Central” takes the reader on a unique literary and artistic journey through the natural and man-made beauty of California’s central coast. 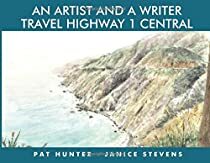 Lavishly illustrated with over 100 original full-color Pat Hunter watercolors depicting gorgeous landscapes and architectural treasures, “An Artist and a Writer Travel Highway 1 Central” is a thinking person’s travel guide that reveals hidden treasures and unexpected delights. Written as a memoir of the authors’ tour along the highway, the book takes an appealingly idiosyncratic perspective, as the authors record their explorations off the beaten path, their serendipitous discoveries, and their personal reactions to the places and people they encounter. A satisfying and contemplative mixture of captivating artistry and personal essay, “An Artist and a Writer Travel Highway 1 Central” reinvents the travel guide as a literary form.